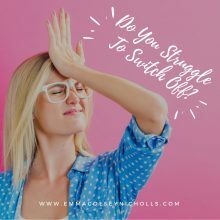 Life can get so busy and overwhelming at times it seems that it is becoming so common that many of us struggle to be able to switch off. I know it can be for me. We have so many dreams and desires and I love and encourage that ambitious mindset. But if we are to get the most from life we have to be able to manage the stress and overwhelm that can come with that. It’s always about the balance right?? My ultimate remedy is getting out onto the mountains and immerse myself into nature. It’s why I am so passionate about the retreats I run. It’s not just about the experience, the mountains are just magical and really allow you to put life into perspective. That and journaling of course which is my favourite tool ever. I know not all of you have that on your door step and I also like to have a whole toolbox of methods that allow me to create some space and indeed perspective when the mind goes into overdrive creating a never ending cycle of thoughts and ideas with absolutely no clue where to start. This can leave you feeling stressed out and exhausted yet when you try and calm the mind it just doesn’t seem to slow down. I know that for me personally, it’s when I can slow that monkey brain and create the space. That is exactly the time when I create the most clarity. I can feel more focused, clearer about when I want to go and also to allow the body and mind to feel re-energised. To do this meditation is often a tool I refer to. We use it on retreats, I advise it to my coaching clients, yet I also know the struggles that come with making it a regular practice. Lack of time, not being able to calm the mind or block out the thoughts, being able to feel like you have done it for long enough, not sure if it will even work for you. These are some of the things that came up when I asked people about the blocks they have when it comes to meditating. So in an aim to answer some of these, this week I talked to meditation teacher and healer Mima Cornish from Hedgerose Healing. You can see the interview and get our top tips for getting started with a meditation practice that works for you. CLICK HERE to check it out. And we always love to know what you think, so if you enjoy the video and find it useful please let us know in the comments and if you have any comments or questions, we love to hear them too. PS – If you want to learn more about our up and coming wellness retreats add your email below to be added to the priority list and get first access to new dates and best prices.